Roughing it is good… haven’t done that in a while. Makes you appreciate the little things. Like toliets and running water. 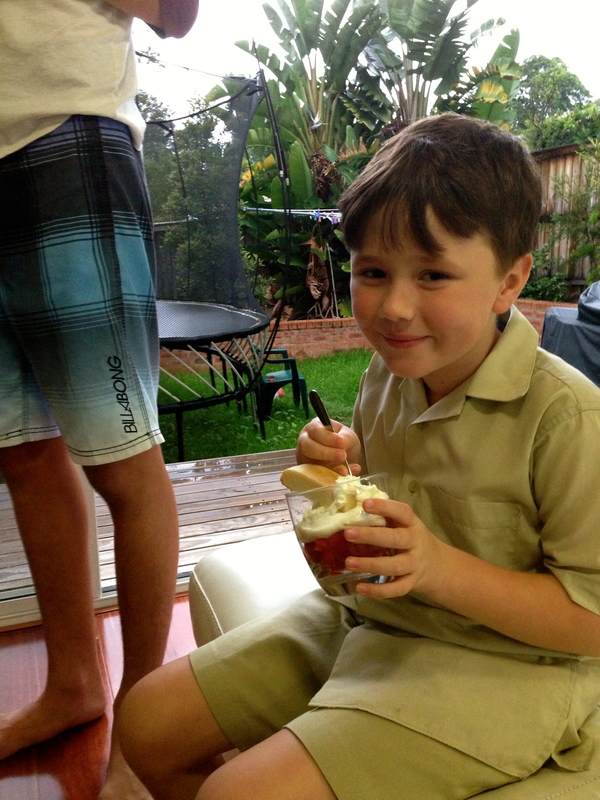 Sweet boys and I love the idea of chopping up the cake.. more of trifle, great idea. Yay, so happy to see you back Sanya. I have been wondering how you were doing – sorry to hear you have had back issues. This is a very sweet welcome back dessert. So nice to see you this week, Sanya! Looks like a delicious version of strawberry shortcake. I like how you chopped it up for easier eating. Your boys are so cute. Hope life is good with the new job and an improved back. Glad you are back with us! 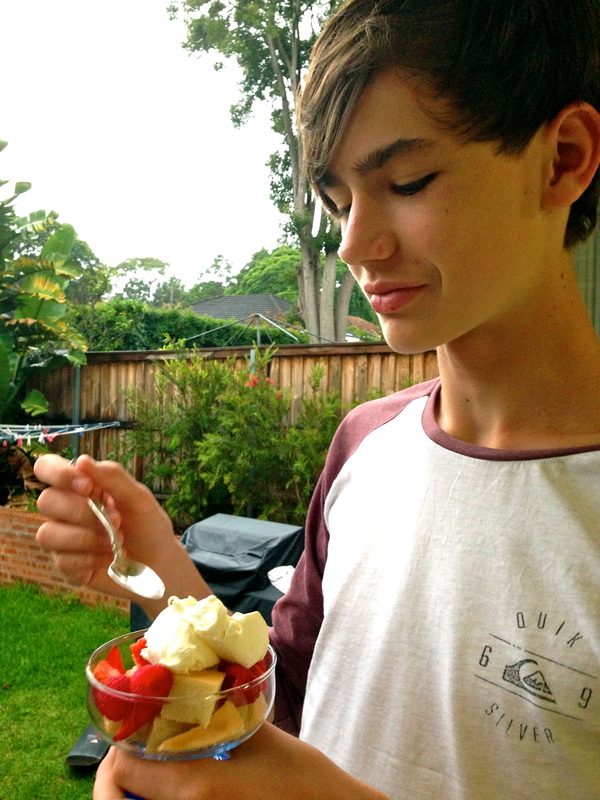 Serving it trifle-style is a nice idea. Such a easy and lovely cake ! Good to see you back, Sanya! Hope your back issues are resolved. You know what they say…”Life is what happens to you while you’re busy making other plans.”. Your Visitandine looks delicious…love that you served it layered in a dessert dish…yum! So nice to see you back! I hope your back and sciatica issues aren’t still plaguing you and congrats on the new job! I bet your son was extra-glad to be back when he saw that dessert. I like your use of it. So sorry to hear that you’ve been suffering back issues. No fun at all, especially if you are also starting a new job. Hope that things are slowly getting back to normal for you. Whatever “normal” means these days. So happy to have you back! I love your action shots – the boys are adorable! And your cake looks fabulous. I can imagine it would be a great treat after a few days of roughing it! I thought it was super yummy too. Welcome back Sanya! I had two back operations due to an untreated sciatica turned discus hernia and I know exactly how painful and frustrating it can. I hope the worse is over. Your boys are so sweet. Like the fabulous dessert they are enjoying! Welcome back and I think it is really nice to see PEOPLE enjoying this food. More action shots! Oh, Sanya, we’re glad to have you back cooking and baking with us. It sounds as if you’ve had a little too much going on – isn’t it crummy how Life gets in the way of FFWD. (Note the cake reference in the last sentence.) It’s fun to see your handsome young men in your Post. Your younger guy looks spiffy in that matching outfit. And, it’s clear that your boys enjoyed this dessert as much as we all did. Take care and glad you are apparently on the mend. Welcome back! It looks like everyone enjoyed eating this dessert! I don’t blame them for grabbing this up before you could take photos. It was so tasty! Your boys are so big now, Sanya! So good to see you again. Welcome back! Your family looks as though they are loving this dessert.